The University of Michigan will close its Confucius Institute next year when the current agreement governing the institute expires. “This transition is driven by a desire to more broadly include the work of exploring and studying Chinese visual and performing arts within U-M’s regular academic and cultural units,” James Holloway, Michigan's vice provost for global engagement and interdisciplinary academic affairs, said in an announcement. Michigan said programming at the Confucius Institute will continue through June of next year. The Confucius Institutes -- Chinese-government funded centers of language and cultural education housed on about 100 U.S. university campuses -- have come under increased scrutiny over the last few years as a number of political figures have called for their closure. Chief among the critics is U.S. senator Marco Rubio, Republican of Florida, who has characterized the institutes as part of a broader effort by the Chinese government to influence American academia and stifle critical analysis of China's history and politics. Supporters of the institutes say they provide valuable resources to offer Chinese language and cultural programming, and that the concerns about academic freedom and institutional autonomy are unfounded or overstated. 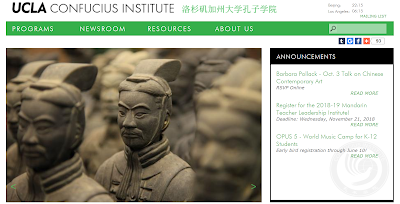 Other American and Canadian universities that have moved to close their Confucius Institutes for various reasons include the University of Chicago, Pennsylvania State University, McMaster University and the Universities of North Florida and West Florida. In April the chancellor of the Texas A&M University system announced the closure of two Confucius Institutes -- one on A&M's main campus in College Station and the other at the Prairie View campus -- after two congressmen wrote an open letter describing the institutes as "a threat to our nation’s security by serving as a platform for China’s intelligence collection and political agenda." The letter from the two congressmen, Representatives Henry Cuellar, a Democrat, and Michael McCaul, a Republican, referenced comments from the Federal Bureau of Investigation director, Christopher Wray, who said in February that the FBI is concerned about the Confucius Institutes and has "developed appropriate investigative steps" in relation to them.